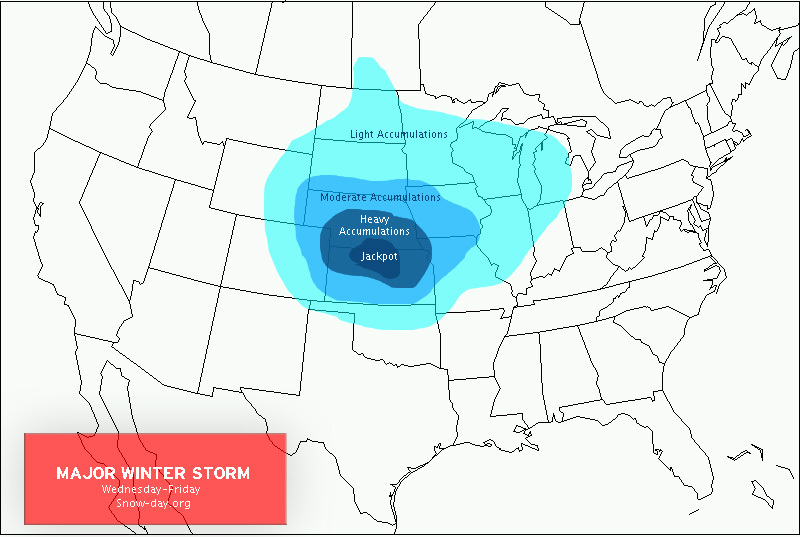 Mid-Month return to winter weather for the central Plains? As you can see, the NAO has been positive for a while but as we head towards the 10th-16th the NAO will start to slide down towards negative range and perhaps even negative by the 16th. This would indicate more potential cold air to wrap into any storm systems around that time. The first trough or cut off low appears near the 9th of this month and as you can see, very little cold air is available at this time for this storm system. 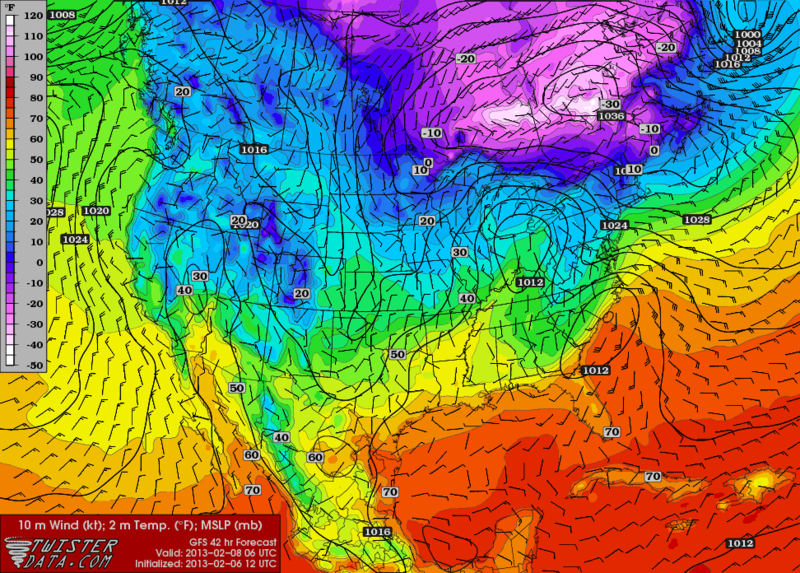 As it moves northeast more cold air will interact but I dont see a huge amount of arctic air involved in this. Another storm system closer to the dates I mentioned when the NAO starts to go negative, colder air is available for storm systems around this time. Now this is way in advance but I’ve seen enough consistency to say that more storminess will occur as we approach mid month! First off I’d like to apologize for the lack of updates recently, but enough of excuses lets get talking about what looks interesting over the next 7-10 days. Looking at this weather feature, a blocking effect is still holding strong in the Hudson Bay Canada forcing this weak storm system to develop some snow from Kansas and Oklahoma to portions of the Ohio Valley and straight to the Middle Atlantic. It remains to be seen if it will strengthen or remain a weak wave or if it will produce any ice accumulations in the Middle Atlantic States and Carolina States. Looking at weather feature number 3, it is looking like after a couple brutally cold weeks for the northern Plains, Great Lakes and Ohio Valley, a warm up will move into those areas next Sunday and possibly extend into the middle of the next week. Overall, not really an active week coming up with more cold air on the way and possibly some snow for the deep south next Thursday. Stay tuned for more updates on these! As you can see the GFS has the swath of snow from northern Kansas to eastern Nebraska and through central and western Iowa and eventually southern and central Wisconsin. The gradient behind the storm is strengthening with strong winds starting to increase after 4-5 PM in Nebraska/Kansas. The NAM model has the same track as well with the snow in the same position. I think we are coming to a consensus in the models here with just a few minor tweaks here and there. 12z CMC has the same storm track as well with the heaviest from eastern Iowa to southern Wisconsin. Overall i think a band of several inches of snow will fall from I-80 in eastern Nebraska on south to central Iowa then northeast to southern Wisconsin. Stay tuned for more updates! 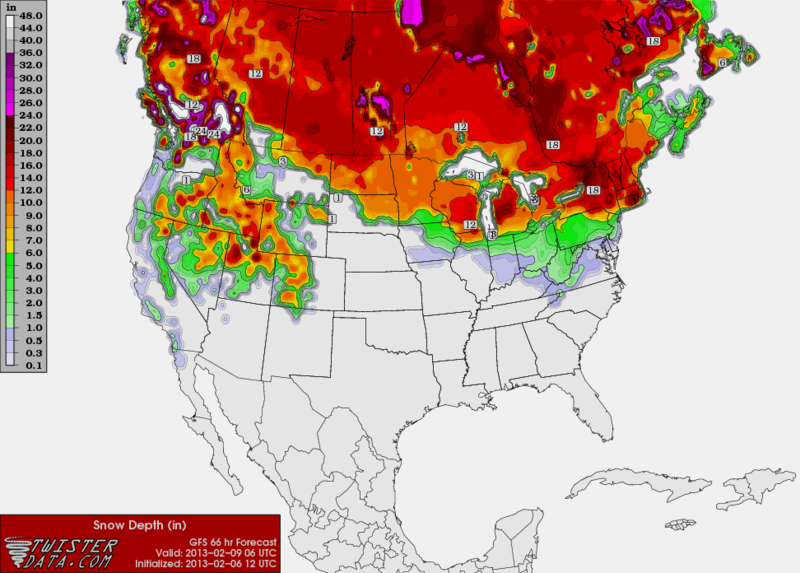 Winter Storm update and White Christmas Forecast! The best area I see for accumulating snow in from western Kansas to central and eastern Nebraska to much of Iowa, southern Minnesota, southern and central Wisconsin. The actual area of significant snow will not actually be this large but the best areas are in blue above. The GFS computer model tracks the low pressure system over Kansas City and lays a swath of significant snow over central and eastern Nebraska, northern Kansas and much of Iowa to much of Wisconsin. 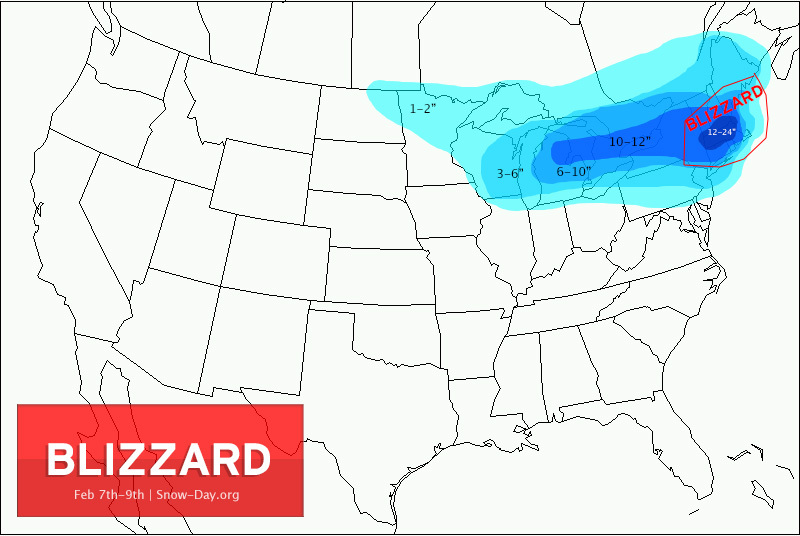 The low begins to tighten up early Thursday with strong winds possibly inducing Blizzard Conditions. With the same path as the GFS computer model I think we can come to a conclusion that the storm system will track near Kansas City northeast to Chicago laying a swath of accumulating snow and strong winds to the NW track of the storm system. The european computer model is a tad more south but the track record with that model is benign considering it has not been the best the last few weeks. The UKMET/CMC model are more so agreeing as well. I will be issuing more 0z model updates later tonight so stay tuned! 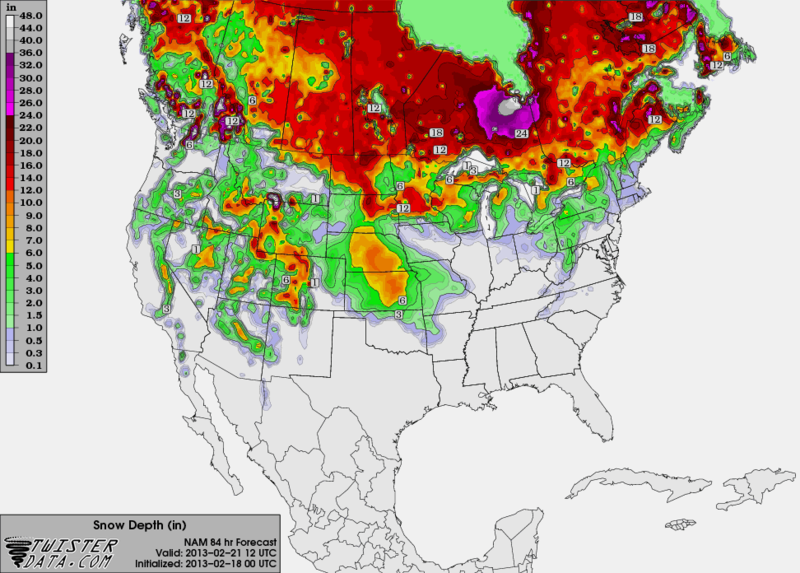 A large area of the Great Plains I believe has a high chance at receiving a White Christmas based on the upcoming storm system coming as well as recent snow still on the ground in the Dakotas and Minnesota. The storm system mid this week will usher in Lake Effect Snow on the Great Lakes thus most of those areas will see a White Christmas. The areas to the south in the possible zone are more iffy regarding a storm system on Christmas day next week, that storm is all over the place so please stay tuned! Good morning everyone, just going ahead with a quick update on the 0z models that came out overnight and most of them are starting to drift north except a few of them. Let’s take a look at them shall we? Let’s just say the european model has totally lost the storm, it doesn’t develop it at all, just a strong cold front with a few cold air advection snow showers. Not really going to go with this computer model run as it is the outlier out of every other model but will pay close attention to it. As you can see the canadian model has a swath of snow from northern Kansas to eastern Nebraska through northern and western Missouri as well as parts of northern Illinois and southern and central Wisconsin. The storm system isn’t too terribly strong but still would lay out a swath of several inches over the mentioned areas. The navy model has a strong storm system, not really negative tilted however, but still has several inches of snow from northwestern Kansas to central and eastern Nebraska and on through Iowa and eventually southern Wisconsin. The GFS model is a lot like the canadian as well as the NAVY model but the european model continually disagrees and either has a progressive storm or nothing at all. Bottom line is there is still way too much uncertainty regarding the track. Some major models are starting to move north with the snow but still a lot of fine tuning to go. The system has not moved on shore yet, which is part of the problem obviously. Gotta get the storm sampled once it moves on land and out of fantasy land. Not saying the EURO couldn’t be right but right now that is the outlier with all the models. Stay tuned for more updates mid day today and later this afternoon after 12z models! Have a great morning and THINK SNOW! The latest 12z euro really digs the storm deep across the dessert southwestern United States and really doesn’t phase the storm system just kind of moves along the front northeast through central Ohio with a swath of snow through central Michigan. Nothing really strong looking here just a quick mover. 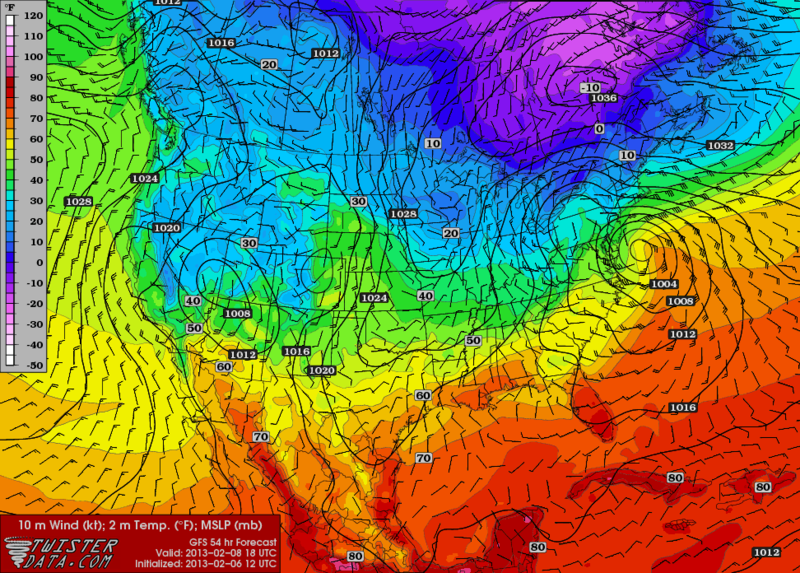 The latest canadian computer model deepens the storm over eastern Kansas and moves it over Chicago early next week. This would break out a swath of moderate-heavy snow from eastern Nebraska to Central Iowa and through southern Wisconsin. The colder air comes in quicker thus moves the storm system further northwest. The 12z navy is rather progressive in nature with the storm system, it really doesn’t phase at all with the cold air and is really just a band of snow and rain along the front as it moves through over parts of Nebraska and Iowa on south. I am not really allowed to post the JMA model or the DGEX model on the model site I use but the JMA model really digs and phases the storm over central Kansas and leaves a significant swath of snow from western Kansas to Nebraska parts of Iowa eastern Minnesota and much of Wisconsin early next week while the DGEX does nearly the same thing. Now, thinking over everything, I really wouldn’t say we have any real agreement among any models going on here. The GFS/EURO model seem to be really weakening the storm system and going way further south while the CMC/JMA/DJEX model all go further north. Really plenty of days to go with pulling our hair out over this storm system but one thing I can say is that i dont think the storm will fall apart, there will be a storm with this very negative NAO and I think the colder air will be stronger then anticipated thus making it go further northwest. But that’s just my two cents. Stay tuned later tonight for updates on the 12z GFS then euro/cmc/navy later on! As you can see, the latest european model develops a large trough in the western United States then hangs back energy in the dessert southwest before phasing over northeastern Texas with snow possible over parts of Oklahoma at this time maybe even some stronger winds. Then it begins to take the low pressure system and starting to negative tilt as it heads over Chicago with a swath of significant snowfall from northern Missouri to southern Wisconsin and parts of central and northern Wisconsin. The latest NAVY model is quite PROGRESSIVE in nature with this storm system with nothing really organized or nothing really that phases ever with the jetstream. Just kinda moves along the front then a post frontal cold front heads east through the Ohio Valley with no real storm system. 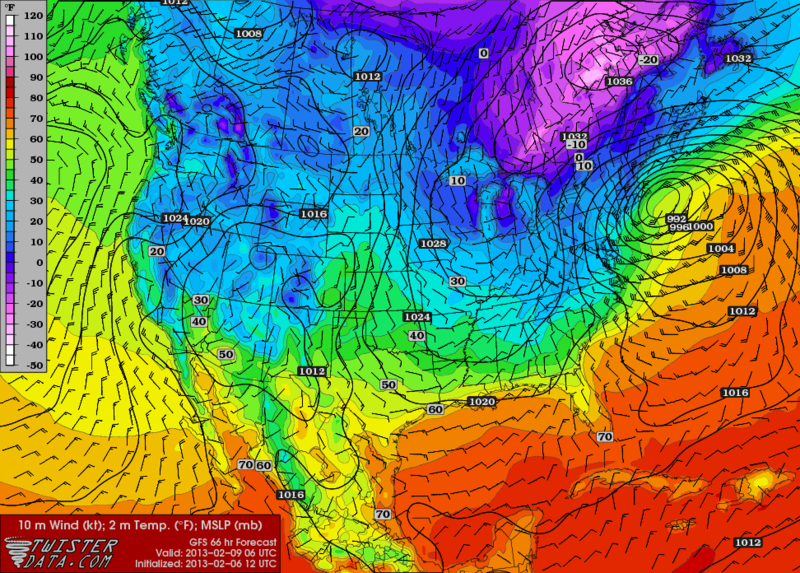 Plenty of cold air to work with though but it quite different from the european model. The canadian model is much further north with the storm system and gathers strength once its in northern Iowa with accumulating snowfall from eastern Nebraska through central and northern Iowa and southern Minnesota with plenty of cold air to work with for snow to fall. Now as I look at all 3 of these major models, one thing still comes to mind that the computer models have very different solutions on what could happen. Depending on how fast the cold air is will determine on how far south this tracks so please stay tuned for a 12z GFS/EURO/NAVY/CMC/NAVY update later on today! Have a great Tuesday morning and THINK SNOW!